Henry was born on 5 March 1812 at Halifax, Yorkshire, the 7th son of parents William and Martha. He was baptised on 5 April 1812. Henry was apprenticed from the age of 14 for seven years. 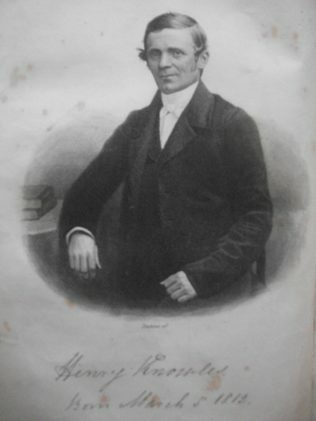 He was inspired by the preaching of Thomas Holliday, who was imprisioned for preaching in the open air. At the age of 16, Henry was converted and soon became a local preacher. His master would not release Henry from his indentures until he was 21. He was then able to commence his itinerant ministry. His obituary records that during his travelling ministry, Henry and his colleagues increased membership by over 1600 on his stations. Henry was also responsible for over 20 chapels, preparing the plans and specifications himself. Henry became Chairman of the Hull District. In 1872 he was appointed treasurer of the Preachers Friendly Society. Henry married Margaret (1808-1889). Census records identify three children. Henry died on 2 May 1877 at Barton upon Humber.